The Lockheed Martin F-35 Lightning II is a family of single-seat, single-engine, fifth-generation multirole fighters under development to perform ground attack, reconnaissance, and air defense missions with stealth capability. The F-35 has three main models; the F-35A is a conventional takeoff and landing variant, the F-35B is a short take-off and vertical-landing variant, and the F-35C is a carrier-based variant. The F-35 is descended from the X-35, the product of the Joint Strike Fighter (JSF) program. It is being designed and built by an aerospace industry team led by Lockheed Martin. The F-35 took its first flight on 15 December 2006. The United States plans to buy 2,443 aircraft. The F-35 variants are intended to provide the bulk of its tactical airpower for the U.S. Air Force, Marine Corps and Navy over the coming decades. JSF development is being principally funded by the United States with additional funding from partners. The partner nations are either NATO members or close U.S. allies. The United Kingdom, Italy, Israel, The Netherlands, Australia, Canada, Norway, Denmark, and Turkey are part of the development program; Japan has ordered the F-35, while Singapore may also equip their air force with the F-35. In initial production and testing, used for training by U.S. The F-35 appears to be a smaller, single-engine sibling of the twin-engine Lockheed Martin F-22 Raptor, and indeed drew elements from it. The exhaust duct design was inspired by the General Dynamics Model 200 design, which was proposed for a 1972 supersonic VTOL fighter requirement for the Sea Control Ship. Lockheed consulted with the Yakovlev Design Bureau in the development of the F-35B STOVL variant, purchasing design data from their development of the Yakovlev Yak-141 "Freestyle". Although several experimental designs have been developed since the 1960s, such as the unsuccessful Rockwell XFV-12, the F-35B is to be the first operational supersonic, STOVL stealth fighter. Acquisition deputy to the assistant secretary of the Air Force, Lt. Gen. Mark D. "Shack" Shackelford has said that the F-35 is designed to be America's "premier surface-to-air missile killer and is uniquely equipped for this mission with cutting edge processing power, synthetic aperture radar integration techniques, and advanced target recognition." Lockheed Martin claims the F-35 is intended to have close- and long-range air-to-air capability second only to that of the F-22 Raptor. Lockheed Martin has said that the F-35 has the advantage over the F-22 in basing flexibility and "advanced sensors and information fusion". Lockheed has suggested that the F-35 could replace the USAF's F-15C/D fighters in the air superiority role and the F-15E Strike Eagle in the ground attack role, although the F-35 lacks the range or payload of the F-15. The F-35A carries a similar air-to-air armament as the conceptual Boeing F-15SE Silent Eagle when both aircraft are configured for low observable operations, having roughly 80 percent of the F-15SE's combat radius under those conditions. The Autonomic Logistics Global Sustainment (ALGS), Autonomic Logistics Information System (ALIS) and Computerized maintenance management system (CMMS) are to help ensure aircraft uptime with minimal maintenance manpower. The Pentagon has moved to open up the competitive bidding by other companies. This was after Lockheed admitted that instead of costing twenty percent less than the F-16 per flight hour, the F-35 would actually cost twelve percent more. Though the ALGS is intended to reduce maintenance costs, Lockheed Martin disagrees with including the cost of this system in the aircraft ownership calculations. USMC have implemented a workaround for a cyber vulnerability in the system. Electrohydrostatic actuators run by a power-by-wire flight-control system. A modern and updated flight simulator, which may be used for a greater fraction of pilot training in order to reduce the costly flight hours of the actual aircraft. Lightweight, powerful and volatile Lithium-ion batteries similar to those that have grounded the Boeing 787 Dreamliner fleet. These are required to provide power to run the control surfaces in an emergency, and have been strenuously tested. Structural composites in the F-35 are 35% of the airframe weight (up from 25% in the F-22). The majority of these are bismaleimide (BMI) and composite epoxy material. The F-35 will be the first mass produced aircraft to include structural nanocomposites, namely carbon nanotube reinforced epoxy. Experience of the F-22's problems with corrosion lead to the F-35 using a gap filler that causes less galvanic corrosion to the airframe's skin, designed with fewer gaps requiring filler and implementing better drainage. The relatively short 35-foot wingspan of the A and B variants is set by the F-35B's requirement to fit inside the Navy's current amphibious assault ship elevators; the F-35C's longer wing is considered to be more fuel efficient. A United States Navy study found that the F-35 will cost 30 to 40 percent more to maintain than current jet fighters; not accounting for inflation over the F-35's operational lifetime. A Pentagon study concluded a $1 trillion maintenance cost for the entire fleet over its lifespan. The engine used on the F-35 is the Pratt & Whitney F135. An alternative engine, the General Electric/Rolls-Royce F136, was under development until December 2011 when the manufacturers canceled the project. Neither the F135 or F136 engines are designed to supercruise in the F-35, however the F-35 can achieve a limited supercruise of Mach 1.2 for 150 miles.The F135 is the second (radar) stealthy afterburning jet engine and, like the Pratt & Whitney F119 from which it was derived, has suffered from pressure pulsations in the afterburner at low altitude and high speed or "screech" during development. Turbine bearing health will be monitored with thermoelectric-powered sensors. The F-35 has a maximum speed of over Mach 1.6. With a maximum takeoff weight of 60,000 lb (27,000 kg), the Lightning II is considerably heavier than the lightweight fighters it replaces. In empty and maximum gross weights, it more closely resembles the single-seat, single-engine Republic F-105 Thunderchief, which was the largest single-engine fighter of the Vietnam war era. The F-35's modern engine delivers over 60 percent more thrust in an aircraft of the same weight so that in thrust to weight and wing loading it is much closer to a comparably equipped F-16. The STOVL F-35B is outfitted with the Rolls-Royce LiftSystem, designed by Lockheed Martin and developed by Rolls-Royce. This system more resembles the Russian Yak-141 and German VJ 101D/E than the preceding STOVL Harrier Jump Jet and the Rolls-Royce Pegasus engine. The Lift System is composed of a lift fan, drive shaft, two roll posts and a "Three Bearing Swivel Module" (3BSM). The 3BSM is a thrust vectoring nozzle which allows the main engine exhaust to be deflected downward at the tail of the aircraft. The lift fan is near the front of the aircraft and provides a counterbalancing thrust using two counter-rotating blisks. It is powered by the engine's low-pressure (LP) turbine via a drive shaft and gearbox. Roll control during slow flight is achieved by diverting unheated engine bypass air through wing-mounted thrust nozzles called Roll Posts. F136 funding came at the expense of other parts of the program, impacting on unit costs. The F136 team has claimed that their engine has a greater temperature margin which may prove critical for VTOL operations in hot, high altitude conditions. Pratt & Whitney has tested higher thrust versions of the F135, partly in response to GE's claims that the F136 is capable of producing more thrust than the 43,000 lbf (190 kN) of early F135s. The F135 has demonstrated a maximum thrust of over 50,000 lbf (220 kN) during testing; making it the most powerful engine ever installed in a fighter aircraft as of 2010. The F-35 features two internal weapons bays, and external hardpoints for mounting up to four underwing pylons and two near wingtip pylons. The two outer hardpoints can carry pylons for the AIM-9X Sidewinder and AIM-132 ASRAAM short-range air-to-air missiles (AAM) only. The other pylons can carry the AIM-120 AMRAAM BVR AAM, Storm Shadow cruise missile, AGM-158 Joint Air to Surface Stand-off Missile (JASSM) cruise missile, and guided bombs. The external pylons can carry missiles, bombs, and fuel tanks at the expense of reduced stealth. An air-to-air load of eight AIM-120s and two AIM-9s is possible using internal and external weapons stations; a configuration of six 2,000 lb (910 kg) bombs, two AIM-120s and two AIM-9s can also be arranged. There are a total of four weapons stations between the two internal bays. Two of these can carry air-to-ground bombs up to 2,000 lb (910 kg) in A and C models, or two bombs up to 1,000 lb (450 kg) in the B model; the other two stations are for smaller weapons such as air-to-air missiles. The weapon bays can carry AIM-120 AMRAAM, AIM-132 ASRAAM, the Joint Direct Attack Munition (JDAM), the Joint Standoff Weapon (JSOW),Brimstone anti-armor missiles, and Cluster Munitions (WCMD). The F-35A includes a GAU-22/A, a four-barrel version of the GAU-12 Equalizer 25 mm cannon. The cannon is mounted internally with 182 rounds for the F-35A or in an external pod with 220 rounds for the F-35B and F-35C; the gun pod has stealth features. The Terma A/S multi-mission pod (MMP) could be used for different equipment and purposes, such as electronic warfare, reconnaissance, or rear-facing tactical radar. Lockheed Martin states that the weapons load can be configured as all-air-to-ground or all-air-to-air, and has suggested that a Block 5 version will carry three weapons per bay instead of two, replacing the heavy bomb with two smaller weapons such as AIM-120 AMRAAM air-to-air missiles.Upgrades are to allow each weapons bay to carry four GBU-39 Small Diameter Bombs (SDB) for A and C models, or three in F-35B. 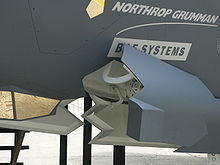 Another option is four GBU-53/B Small Diameter Bomb IIs in each bay on all F-35 variants. One F-35 has been outfitted with four SDB II bombs and an AMRAAM missile to test adequate bay door clearance. The MBDA Meteor air-to-air missile may be adapted for the F-35, a modified Meteor with smaller tailfins for the F-35 was revealed in September 2010; plans call for the carriage of four Meteors internally. The United Kingdom planned to use up to four AIM-132 ASRAAM missiles internally, later plans call for the carriage of two internal and two external ASRAAMs. The external ASRAAMs are planned to be carried on "stealthy" pylons; the missile allows attacks to slightly beyond visual range without employing radar. Norway and Australia are funding an adaption of the Naval Strike Missile (NSM) for the F-35. Under the designation Joint Strike Missile (JSM), it is to be the only cruise missile to fit the F-35's internal bays; according to studies two JSMs can be carried internally with an additional four externally. The F-35 is expected to take on the Wild Weasel mission, though there are no planned anti-radiation missiles for internal carriage. The B61 nuclear bomb was initially scheduled for deployment in 2017; as of 2012 it is expected to be in the early 2020s. According to reports in 2002, solid-state lasers were being developed as optional weapons for the F-35. The F-35 is also one of the target platforms for the High Speed Strike Weapon, assuming that hypersonic missile is successful. The F-35 has been designed to have a low radar cross-section primarily due to the shape of the aircraft and the use of stealthy materials in its construction, including fiber-mat. Unlike the previous generation of fighters, the F-35 was designed for very-low-observable characteristics. Besides radar stealth measures, the F-35 incorporates infrared and visual signature reduction measures. The Fighter Teen Series (F-15, F-16, F/A-18) carried large external fuel tanks, but in order to avoid negating its stealth characteristics the F-35 must fly most missions without them. Unlike the F-16 and F/A-18, the F-35 lacks leading edge extensions and instead uses stealth-friendly chines for vortex lift in the same fashion as the SR-71 Blackbird. The small bumps just forward of the engine air intakes form part of the diverterless supersonic inlet(DSI) which is a simpler, lighter means to ensure high-quality airflow to the engine over a wide range of conditions. These inlets also crucially improve the aircraft's very-low-observable characteristics. In spite of being smaller than the F-22, the F-35 has a larger radar cross-section; said to be roughly equal to a metal golf ball rather than the F-22's metal marble. The F-22 was designed to be difficult to detect by all types of radars and from all directions. The F-35 on the other hand manifests its lowest radar signature from the frontal aspect due to design compromises. Its surfaces are shaped to best defeat radars operating in the X and upper S band, which are typically found on fighters, surface-to-air missiles and their tracking radars; the F-35 would be easier to detect using other radar frequencies. Because the aircraft's shape is important to the radar cross-section (RCS), special care must be taken to maintain the "outer mold line" during production. Ground crews require Repair Verification Radar (RVR) test sets to verify the RCS after performing repairs, which is not a concern upon non-stealth aircraft. In late 2008 the air force revealed that the F-35 would be about twice as loud at takeoff as the McDonnell Douglas F-15 Eagle and up to four times as loud during landing. As a result, residents near Luke Air Force Base, Arizona and Eglin Air Force Base, Florida, possible home bases for the jet, requested that the air force conduct environmental impact studies concerning the F-35's noise levels. The city of Valparaiso, Florida, adjacent to Eglin AFB, threatened in February 2009 to sue over the impending arrival of the F-35s, but this lawsuit was settled in March 2010. It was reported in March 2009 that testing by Lockheed Martin and the Royal Australian Air Force revealed that the F-35 was not as loud as first reported, being "only about as noisy as an F-16 fitted with a Pratt & Whitney F100-PW-200 engine" and "quieter than the Lockheed Martin F-22 Raptor and the Boeing F/A-18E/F Super Hornet." According to an acoustics study done by Lockheed Martin and the U.S. Air Force, the noise levels of the F-35 are found to be comparable to the F-22 Raptor and F/A-18E/F Super Hornet. A USAF environmental impact study found that replacing F-16s with F-35s at Tucson International Airport would subject more than 21 times as many residents to extreme noise levels. The F-35 features a full-panel-width glass cockpit touch screen "panoramic cockpit display" (PCD), with dimensions of 20 by 8 inches (50 by 20 centimeters). A cockpit speech-recognition system (DVI) provided by Adacel has been adopted on the F-35, added to the pilot's ability to interact with the aircraft and operate its systems. The F-35 will be the first operational U.S. fixed-wing aircraft to employ this DVI system, although similar systems have been used on the AV-8B Harrier II and trialled in previous aircraft, such as the F-16 VISTA. 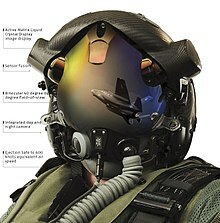 A helmet-mounted display system (HMDS) will be fitted to all models of the F-35. While some fighters have offered HMDS along with a head up display (HUD), this will be the first time in several decades that a front line fighter has been designed without a HUD. The F-35 is equipped with a right-hand HOTAS side stick controller. The Martin-Baker US16E ejection seat is used in all F-35 variants. The US16E seat design balances major performance requirements, including safe-terrain-clearance limits, pilot-load limits, and pilot size; it uses a twin-catapult system housed in side rails. The F-35 employs an oxygen system derived from the F-22's own system, which has been involved in multiple hypoxia incidents on that aircraft; unlike the F-22, the flight profile of the F-35 is similar to other fighters that routinely use such systems. The F-35's sensor and communications suite is said to possess situational awareness, command-and-control and network-centric warfare capabilities. The main sensor on board is the AN/APG-81 AESA-radar, designed by Northrop Grumman Electronic Systems. It is augmented by the nose-mounted Electro-Optical Targeting System (EOTS); designed by Lockheed Martin, it provides the capabilities of the externally mounted Sniper XR pod while making a reduced radar presence. The AN/ASQ-239 (Barracuda) system is an improved version of the AN/ALR-94 EW suite on the F-22. The AN/ASQ-239 provides sensor fusion of RF and IR tracking functions, basic radar warning, multispectral countermeasures for self-defense against threat missiles, situational awareness and electronic surveillance; employing 10 radio frequency antennae embedded into the edges of the wing and tail. Six additional passive infrared sensors are distributed over the aircraft as part of Northrop Grumman's AN/AAQ-37 distributed aperture system(DAS), which acts as a missile warning system, reports missile launch locations, detects and tracks approaching aircraft spherically around the F-35, and replaces traditional night vision goggles for night operations and navigation. All DAS functions are performed simultaneously, in every direction, at all times. The F-35's Electronic Warfare systems are designed by BAE Systems and include Northrop Grumman components. Some functions such as the Electro-Optical Targeting System and the Electronic Warfare system are not usually integrated on fighters. The communications, navigation and identification (CNI) suite is designed by Northrop Grumman and includes the Multifunction Advanced Data Link (MADL), as one of a half dozen different physical links. The F-35 will be the first jet fighter with sensor fusion that combines radio frequency and IR tracking for continuous target detection and identification in all directions which is shared via MADL to other platforms without compromising low observability. The non-stealthy Link 16 is also included for communication with legacy systems. The F-35 has been designed with synergy between sensors as a specific requirement, the aircraft's "senses" being expected to provide a more cohesive picture of the reality around it and be available for use in any possible way and combination with one another; for example, the AN/APG-81 multi-mode radar also acts as a part of the electronic warfare system. Unlike previous aircraft, such as the F-22, much of the new software for the F-35 is written in C and C++, because of programer availability. Much Ada83 code is reused from the F-22. The Integrity DO-178B real-time operating system (RTOS) from Green Hills Software runs on COTS Freescale PowerPC processors. The final Block 3 software for the F-35 is planned to have 8.6 million lines of software code. The scale of the program has led to a software crisis as officials continue to discover that additional software needs to be written. General Norton Schwartz has said that the software is the biggest factor that might delay the USAF's initial operational capability. Michael Gilmore, Director of Operational Test & Evaluation, has written that, "the F-35 mission systems software development and test is tending towards familiar historical patterns of extended development, discovery in flight test, and deferrals to later increments." The F-35's electronic warfare systems are intended to detect hostile aircraft, then scan them with the electro-optical system to allow the pilot to engage or evade the opponent before the F-35 is detected. The CATbird avionics testbed for the F-35 program has proved capable of detecting and jamming radars, including those used on the F-22. The F-35 was previously considered a platform for the Next Generation Jammer; however attention has shifted to the use of unmanned aircraft as an alternate platform. Several "critical electronic subsystems" of the F-35 depend on Xilinx FPGAs. These COTS components allow for refreshes in supplies from the commercial market and to field upgrade the entire fleet via software for the aircraft's software-defined radio systems. The F-35 does not need to be physically pointing at its target for weapons to be successful. Sensors can track and target a nearby aircraft from any orientation, provide the information to the pilot through his helmet (and therefore visible no matter which way the pilot is looking), and provide the seeker-head of a missile with sufficient information. Recent missile types provide a much greater ability to pursue a target regardless of the launch orientation, called "High Off-Boresight" capability. Sensors use combined radio frequency and infra red (SAIRST) to continually track nearby aircraft while the pilot's helmet-mounted display system (HMDS) displays and selects targets; the helmet system replaces the display-suite-mounted head-up display used in earlier fighters. The F-35's systems provide the edge in the "observe, orient, decide, and act" OODA loop; stealth and advanced sensors aid in observation (while being difficult to observe), automated target tracking helps in orientation, sensor fusion simplifies decision making, and the aircraft's controls allow the pilot to keep their focus on the targets, rather than the controls of their aircraft. Problems with the Vision Systems International helmet-mounted display led Lockheed Martin to issue a draft specification for alternative proposals in early 2011, to be based around the Anvis-9 night vision goggles. BAE Systems was selected to provide the alternative system in late 2011. If successful, the BAE Systems alternative helmet is to incorporate all the features of the VSI system. Adopting the alternative helmet would require a cockpit redesign. In 2011, Lockheed granted VSI a contract to fix the vibration, jitter, night-vision and sensor display problems in their helmet-mounted display. A speculated potential improvement is the replacement of Intevac’s ISIE-10 day/night camera with the newer ISIE-11 model. In October 2012, Lockheed stated that progress had been made in resolving the technical issues of the helmet-mounted display, and cited positive reports from night flying tests; it had been questioned whether the helmet system allows pilots enough visibility at night to carry out precision tasks. In 2013, in spite of continuing problems with the helmet display, the F-35B model completed 19 nighttime vertical landings onboard the USS Wasp at sea, using modified procedures using DAS instead of the helmet's built in night vision capabilities, which offer at best 20/35 vision. The program's maintenance concept is for any F-35 to be maintained in any F-35 maintenance facility and that all F-35 parts in all bases will be globally tracked and shared as needed. The commonality between the different variants has allowed the USMC to create their first aircraft maintenance Field Training Detachment to directly apply the lessons of the USAF to their F-35 maintenance operations. The aircraft has been designed for ease of maintenance, with 95% of all field replaceable parts "one deep" where nothing else has to be removed to get to the part in question. For instance the ejection seat can be replaced without removing the canopy, the use of low-maintenance electro-hydrostatic actuators instead of hydraulic systems and an all-composite skin without the fragile coatings found on earlier stealth aircraft. The F-35 has received good reviews from pilots and maintainers, suggesting it is performing better than its predecessors did at a similar stage of development. The stealth type has proved relatively stable from a maintenance standpoint. Part of the improvement is attributed to better maintenance training, as F-35 maintainers have received far more extensive instruction at this early stage of the program than on the F-22 Raptor. The F-35's stealth coatings are much easier to work with than those used on the Raptor. Cure times for coating repairs are lower and many of the fasteners and access panels are not coated, further reducing the workload for maintenance crews. Some of the F-35's radar-absorbent materials are baked into the jet's composite skin, which means its stealthy signature is not easily degraded. It is still harder to maintain (due to its stealth) than fourth-generation aircraft.